The almost circular Maarsee of the Pulvermaar is surrounded by a wall of volcanic rock and testifies to the explosive past of the volcanic Eifel. 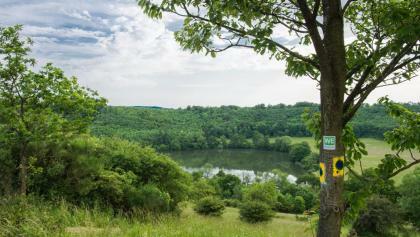 The Pulvermaar is one of the best preserved maar lakes in the Western Eifel. With a water depth of about 72 m, the Maarsee is the deepest Eifelsee and one of the deepest lakes in Germany. It has a diameter of 1 km and holds about 13 million cubic meters of water. The Pulvermaar was formed by massive volcanic eruptions around Gillenfeld and is still surrounded by a mighty tuff wall. The ejected volcanic loose material of the mary is well suited as a building material. Over the years, loose tuffs were mined in two pits on the southern edge of the Pulvermaar.